Jim Allister expressed concerns (December 1) that Monday’s High Court judgement on abortion laws would “worry many people” and should be appealed. There needs to be a legal case in order to lodge an appeal and no doubt many legal eagles will be looking into this. Mr Allister goes on to claim that the human rights of the unborn child have been given no thought. This is not the case. I listened with my own ears as Justice Horner ruled that “the unborn child does not enjoy a full ‘right to life’ under article 2”. There were also numerous examples of case law cited where it has been ruled that prior to either the moment of birth or a foetus being capable of independent life does not have independent rights or interests. Justice Horner went on to say that no convincing grounds had been put to him to conclude otherwise, pages 34-38 in the full judgement. 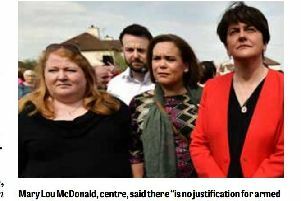 Mr Allister then insisted the present law was “not an absolute bar to abortion in cases of fatal foetal abnormalities”. If this is the case then perhaps he might demand that guidance be provided for all medical staff to inform them what they can offer to pregnant women having to deal with these situations rather than denying access to healthcare and forcing some to travel to other countries if they have the cash to do so instead? Mr Allister’s other issue claimed “the courts have over stepped their boundaries and sought to change the law rather than apply it. The judiciary should not seek to legislate any more than the legislature should seek to judge.” This was also a point that Justice Horner addressed with concern when he very clearly stated that “these highly sensitive matters have not been debated by the Assembly and are unlikely to be debated by the assembly in the foreseeable future”. In conclusion, I agree with Mr Allister that people should be worried that the courts have had to do the job he and our other 107 MLA’s have been elected to do but won’t.